Something went wrong with a Russian Progress resupply mission moments before the spacecraft deployed into orbit Tuesday on the way to the International Space Station, and investigators are analyzing whether the stricken supply ship may have lost control after a botched separation from its Soyuz rocket booster. Officials from the Russian space agency, or Roscosmos, gave up hopes of salvaging the Progress M-27M spacecraft Wednesday, writing off the possibility of continuing the mission to deliver more than three tons of supplies to the space station. Roscosmos said in a statement Wednesday that mission control lost communications with the Progress spacecraft 1.5 seconds before the cargo carrier’s planned separation from the third stage of its Soyuz launcher. Engineers later regained intermittent telemetry from the troubled unmanned spaceship indicating it deployed from the Soyuz rocket, which also stopped sending data to ground teams around the same time, according to Roscosmos chief Igor Komarov. The U.S. military is tracking a cloud of debris around the out-of-control Progress spacecraft and the Soyuz rocket’s third stage, according to a press release issued by the Joint Functional Component Command for Space’s Joint Space Operations Center, or JSpOC. The military unit said Tuesday its tracking sensors indicated the Progress spacecraft was spinning once every five seconds. Video from a camera on-board the spacecraft released by NASA on Tuesday also showed the Progress in a fast rotation. “Additionally, the JSpOC has observed 44 pieces of debris in the vicinity of the resupply vehicle and its upper stage rocket body,” the U.S. military’s statement said. While experts were unable to verify the origin of the fragments around the Progress resupply freighter and its rocket, the detection raises the question of whether an explosion or collision may have led to the mission’s failure. A NASA TV commentator said after the launch that telemetry data received from the Progress spaceship indicated its power-generating solar panels extended as planned, but ground controllers could not confirm its navigation antennas deployed or its propulsion pressurized. 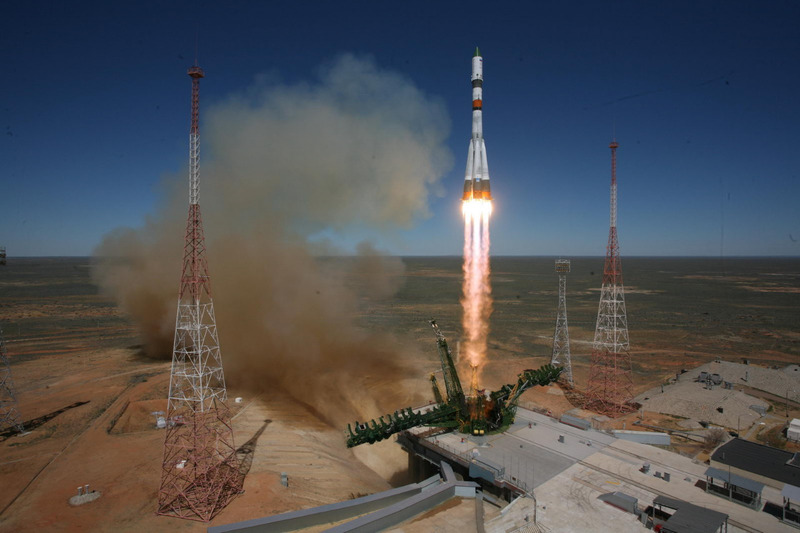 The mission’s launch from the Baikonur Cosmodrome in Kazakhstan on Tuesday marked the second Progress spacecraft to fly aboard a modernized version of Russia’s mainstay Soyuz rocket. The launcher’s upgraded configuration — named the Soyuz 2-1a — uses updated electronics, a digital flight control system, and can loft 300 more kilograms — about 660 pounds — to the International Space Station’s orbit than previous iterations of the Soyuz rocket, according to Roscosmos. The Soyuz 2-1a’s third stage uses the same kerosene-fueled RD-0110 engine flown on older versions of the rocket. The Soyuz 2-1a configuration logged 21 flights before Tuesday’s launch, with no failures attributed to the basic three-stage Soyuz core booster. A report by Russia’s Tass news agency Wednesday claimed the RD-0110 engine burned longer than designed during Tuesday’s launch, citing a source from the engine’s manufacturer. “The contingency with the Progress spacecraft might have been caused by problems with the engine control system that was giving commands,” Tass said in its report. 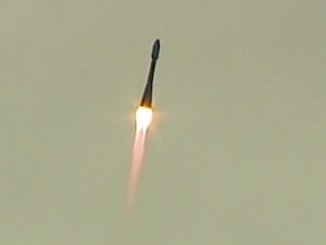 RD-0110 engines have flown on more than 1,500 launches, according to Tass. 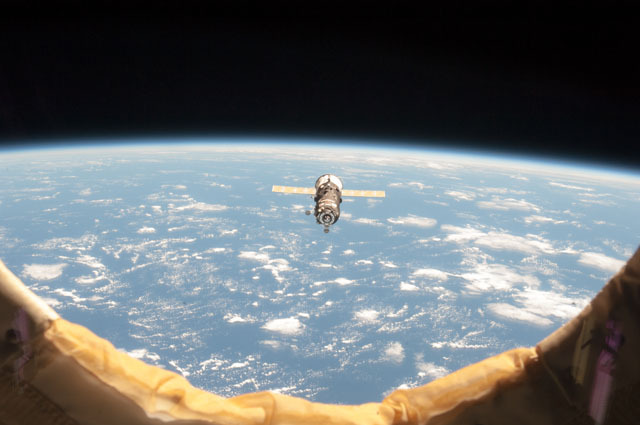 Roscosmos officials said the Progress supply ship should remain in orbit until between May 5 and May 7, when it will succumb to natural atmospheric drag and fall back to Earth. Most of the craft will burn up during re-entry, which could occur anywhere between 51.6 degrees north and south latitude. Komarov said mission controllers have not given up trying to command the spaceship to conduct a guided re-entry over the ocean — a practice normally executed at the end of Progress missions — but engineers have so far been unsuccessful in repeated attempts to wrestle control of the errant cargo craft. Some pieces of the spacecraft could hit Earth’s surface after the plunge through the atmosphere, but the event’s risk to life and property is very low, even if the Progress comes down uncontrolled. NASA and Roscosmos officials said the space station residents were in no danger after the accident, and the Progress spacecraft is on a trajectory far below the altitude of the research complex. The Progress mission was set to ferry more than three tons of food, supplies and experiments to the space station’s six-person crew. 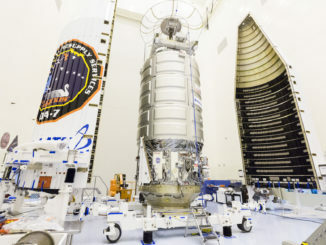 Despite the failure, the crew has enough food and other provisions to get by until at least early September, according to data on space station consumables shared by a NASA official. 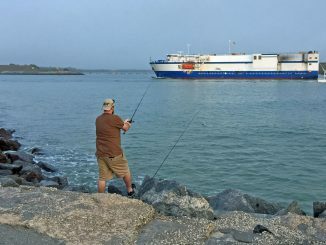 A commercial Dragon cargo craft owned by SpaceX is set for launch June 19 to replenish the space station’s stock of supplies, and a Japanese HTV logistics mission will head for the complex Aug. 17. The next Progress launch was set for launch Aug. 6, but that could change as a result of this week’s mishap. Roscosmos managers only said Wednesday that the next two Progress missions were expected to go up in the third and fourth quarters of this year. Russian experts are also tracing any impact the Progress failure could have on the launch of the next three-person crew to the International Space Station. The trio will blast off on a Soyuz rocket similar to the booster used on Tuesday’s bungled flight. The investigation board’s report is due to be submitted May 13, Roscosmos said.